There's not much better than a good infomercial—except maybe a really bad one. But these days there's no better innovation hotbed than basic cable paid programming. Here we separate product from pitchman, and celebrate the brains behind As-Seen-On-TV. Hard as it is to imagine that one man's mind could be so fertile, both the Chia Pet and the Clapper were pioneered by the same person. To be fair, Joseph Pedott didn't invent them in their original incarnations. But he's responsible for fine-tuning them, sublimating them from rinky dink doohickeys no one wanted to rinky dink doohickeys that sold millions. Pedott's start was actually in advertising—which may explain why his jingles have outlived his products. Not a lot's been written about the man behind the most famous blender in the world, or he named his life's crowning work to sound so much like an adult toy. But Homeland House chairman Lenny Sands holds the patents to the Magic Bullet and its attachments—including the Party Mugs. It's hard to escape the suggestive spots for this upper-body toner, or its parodies. Which came as a surprise to the Shake Weight inventor,Johann Verheem , who set out with the simple goal of combining the inertia-based exercise equipment pioneered in the 90s with the familiar form factor of a dumbbell. And while Verheem's largest contribution to society may ultimately be innuendo, he maintains that San Diego State researchers have proven the Shake Weight's validity. As hard as it is to believe, former Heavyweight champion George Foreman did not, in fact, engineer his eponymous grill. My generation's dorm room salvation was invented in 1993 by one Michael Boehm. Foreman didn't join the team until a year after Boehm had come up with the device, but was integral in helping it gain wider distribution through a company called Salton. Speaking of celebrity spokespeople, there are few more endearing—or more fit—than Jack LaLanne. But while I don't doubt LaLanne has imbibed more than his share of juiced goodness, all credit for the original power juicer goes to Dr. Norman Walker, a Scottish immigrant to the US who promoted a raw foods lifestyle as early as 1930. His Norwalk Hydraulic Press Juicer is still sold today as a separate product, but it's the fruit from which all other juicers have been squeezed. 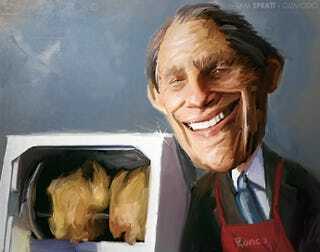 Ron Popeil retired from Ronco in 2005, but he's still the undisputed king of TV inventors. Why Popeil? Because not only did the man practically create the format (and many of its most popular conventions) whole cloth, he also actually did most of the inventing. Here's just a few of the gadgets he can claim intellectual ownership of since his 1954 TV debut: The Chop-O-Matic. The Popeil Pocket Fisherman. The Inside-The-Shell Egg Scrambler. Hair in a Can Spray. The Smokeless Ashtray. It's as though Billy Mays had moonlighted as a chemical engineer.